Stop it with the McDonald's (MCD - Get Report) love business, media friends. Just stop it. The fast-food giant finds itself in the news this week, as it will start selling $1 soft drinks and $2 McCafe specialty drinks in the U.S. as a means to jump-start dreadful traffic trends. I can't help but notice the growing enthusiasm among the media and some veteran restaurant analysts about the impact this initiative will have on Mickey D's. Well, here's a newsflash, people. McDonald's didn't say it has invented a new, mind-blowing sugary drink that will capture the attention of most of the teen population that has never eaten a Big Mac (they still love Chipotle (CMG - Get Report) , even with the risk of catching E.Coli). McDonald's also didn't say it has developed an epic $2 coffee drink that could steal a good chunk of Starbucks (SBUX - Get Report) customers disenchanted with congested stores. Let's be very clear what McDonald's has done with this new drink promotion, and that of the recent one of launching different sized Big Macs. The company is picking its most profitable items on the menu and using them to drive traffic among loyal, older people. Unfortunately, those are the people that in many cases have one foot in the grave. There is nothing on offer right now that suggests McDonald's is keen on reinventing itself to attract a new customer base, or those currently aged 13 to 21 that are being pulled into Chipotle, Freshii or whatever other hip new fast casual dining eatery exists around the block. I feel so strongly about the bear position on McDonald's, that I drew up this tidy list. I believe it's helpful. McDonald's has no mobile presence. None. Zero. Zilch. 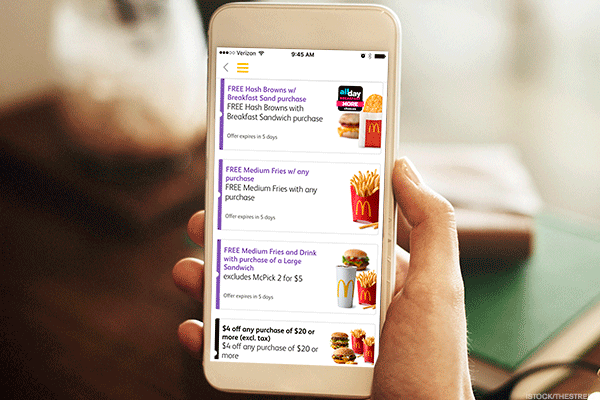 While Starbucks and Panera (PNRA mint money from order-ahead technology, McDonald's is still fumbling around to get its global mobile ordering app up and running. It was supposed to launch in January, but it hasn't. The guy formerly overseeing tech at McDonald's left a few months ago to join a car company. I suspect the app may not come until later in the year and it will not be global. Further, when it does launch it could simply destroy restaurants that already have trouble keeping up with order-taking inside and via the drive-thru. And additionally, McDonald's doesn't have the type of food that holds up well to order-ahead technology, so if the market is banking on a huge mobile ordering sales boost, think again. Who the heck wants to eat a lukewarm Big Mac? McDonald's is showing even less menu creativity. Back in the day, McDonald's would at least take risks with its menu to try and attract customers. Some ideas were colossal failures, but ultimately iconic sandwiches such as the filet-o-fish and Big Mac were born out of a franchisee taking a risk and McDonald's management taking the product national. Under current CEO Steve Easterbrook, McDonald's has gone completely risk averse on its menu. The ingredients aren't being improved quickly enough. 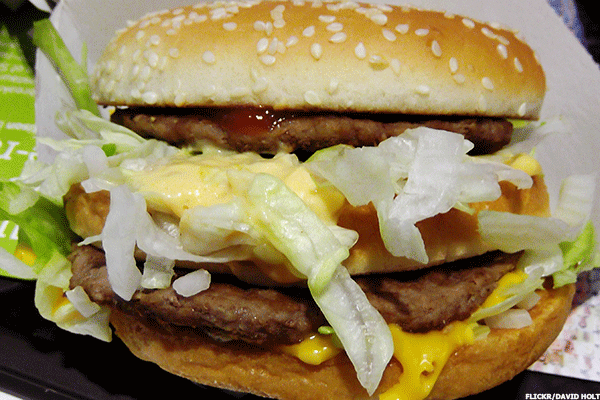 Why does Big Mac sauce still contains zillions of ingredients? Where is the killer new sandwich at an unbeatable McDonald's price-point? Easterbrook has become too obsessed with trying to improve McDonald's order accuracy and through-put and forgot that it's OK to take some risks on the menu. The company has to find some creativity. Why else pay a team of trained chefs at headquarters then? Now that McDonald's is well down the path to be a mostly franchisee run operation (which is good for profits and cash flow) it has to think big in order to excite Wall Street. One way it could do that is by going back to building a portfolio of emerging restaurant brands, something it eschewed when it sold Chipotle and the Donatos pizza chain years ago. Look at Restaurant Brands (QSR - Get Report) -- it saw an attractive, likely undervalued asset in Popeyes (PLKI and bought it for $1.8 billion. Knowing the Restaurant Brands management team, over the next five years Popeyes will become a growth juggernaut with a more fun menu. McDonald's could have easily bought Popeyes and scaled it up even faster than Restaurant Brands to take on Yum! Brands (YUM - Get Report) red-hot KFC. McDonald's has made no indication it wants to build a portfolio of restaurant brands. And to be honest, that is a dumb move. Despite improving its food quality and expanding its popular all-day breakfast menu, McDonald's is still having trouble getting people through the door. Mickey D's guest counts in the U.S. fell 2.1% last year. In 2015, guest counts in the U.S. dropped 3.0%. Guest counts in the U.S. haven't risen since 2012, when they gained 1.9%. Where is the McDonald's mobile app? Jim Cramer and the AAP team hold a position in Starbucks and Panera Bread for their Action Alerts PLUS Charitable Trust Portfolio. Want to be alerted before Cramer buys or sells SBUX or PNRA? Learn more now. Action Alerts PLUS, which Cramer co-manages as a charitable trust, is long SBUX and PNRA.